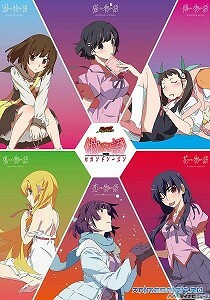 Monogatari Series: Second Season is Japanese anime TV series based on novels written by Nisio Isin and illustrated by Vofan. Two seasons were created. The story centers on Koyomi Araragi, a third-year high school student who survived a vampire attack, and finds himself helping some girls involved with all kinds of apparitions, gods, ghosts, mythological beasts, and spirits. 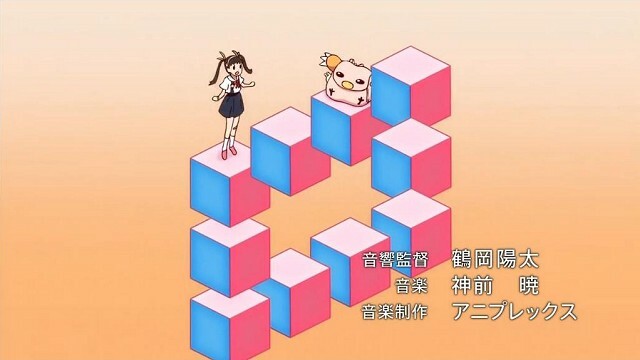 There's moving impossible figure in the opening of the 8th episode of the 2nd season. The screenshot is represented below. Another screenshots of Escher inspired scenes from this television series. This scene was inspired by Escher's lithograph "Another World II"
This scene was inspired by Escher's lithograph "Printgallery"
This scene was inspired by Escher's lithograph "Relativity"